Risky Business draws on decades of research in the fields of psychology, neuroscience and behavioural economics to explain why so-called rational minds are frequently fooled by over 100 unconscious biases. 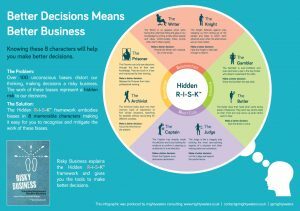 Written for practitioners, Risky Business presents the Hidden R-I-S-K™ Framework, a practical tool that helps you notice and mitigate the work of these unconscious biases. Risky Business is written with decision makers in mind. Through stories and anecdotes, you will meet eight characters that embody the unconscious biases that distort our thinking and decisions. If you want to make better decisions, Risky Business is a MUST READ book. Risky Business launches at the London Stock Exchange? Bring an interesting, thought-provoking, practical, lively and interactive keynote address to your conference. Immerse teams in an experiential and interactive workshop that will enable them to understand the work of unconscious biases and identify practical actions to mitigate their effects in their work and decision making processes. Research points clearly to a need to de-bias strategic decisions. Raising a company’s game from the bottom to the top quartile on the decision-making process improved its ROI by 6.9 percentage points. The Hidden R-I-S-K™ framework gives leaders a tool to do just that. Contact us to discuss how we can help you improve your decision-making process. Efforts to improve Diversity and Inclusion (D&I) in organisations fail when discussion of bias is framed in terms of individual moral failure. As unconscious biases are prevalent in all of us, we see the challenge in terms of suboptimal decision making. Our focus is to help people see the work of the unconscious and discuss it in a generative way, so that action is taken to improve. The Hidden R-I-S-K™ framework provides a language people can use to discuss unconscious biases in this positive, no blame way. If you would like to improve the impact of your D&I actions get in touch.